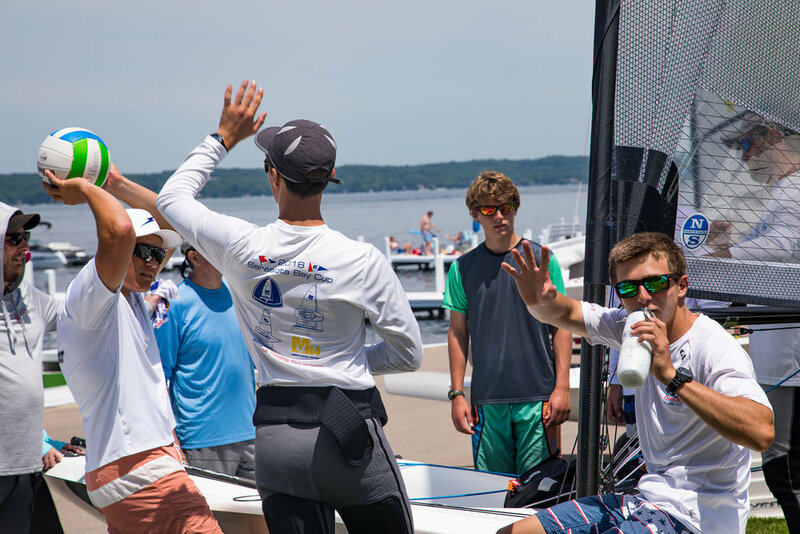 LAKE GENEVA, Wis. (June 17, 2018) – Harry Melges IV earned the first Melges 14 US National Championship title, beating out the fleet of 36 boats at the Lake Geneva Yacht Club. 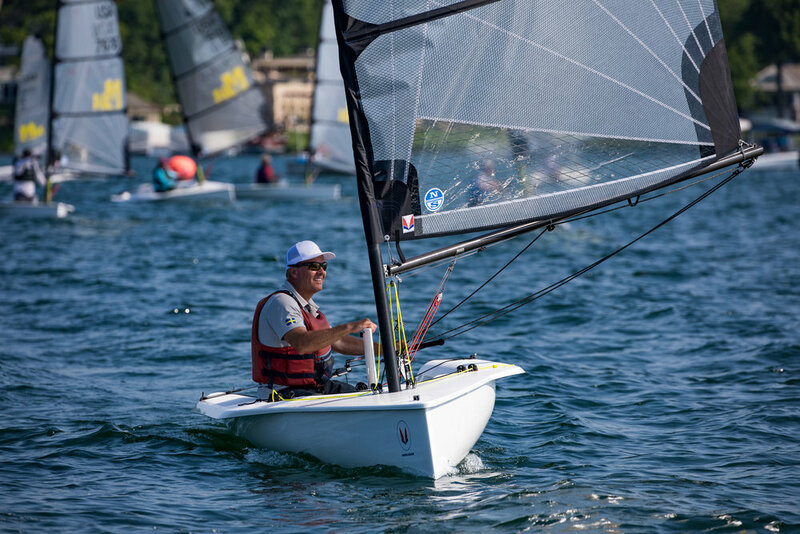 After nine races, Melges beat out Eddie Cox by a two point margin. Young Chapman Petersen rounded out the podium. Peyton Ankers of Chattanooga, TN finished one place ahead of San Francisco’s Jennifer Canestra to earn Top Woman. Joey Plummer was the top finishing Blue Rig, and Victor Larimer earned the title in the Red Rig. The regatta opened with two moderate breeze races on Friday. Sailing to the early regatta lead was Eddie Cox with a solid 2,3. 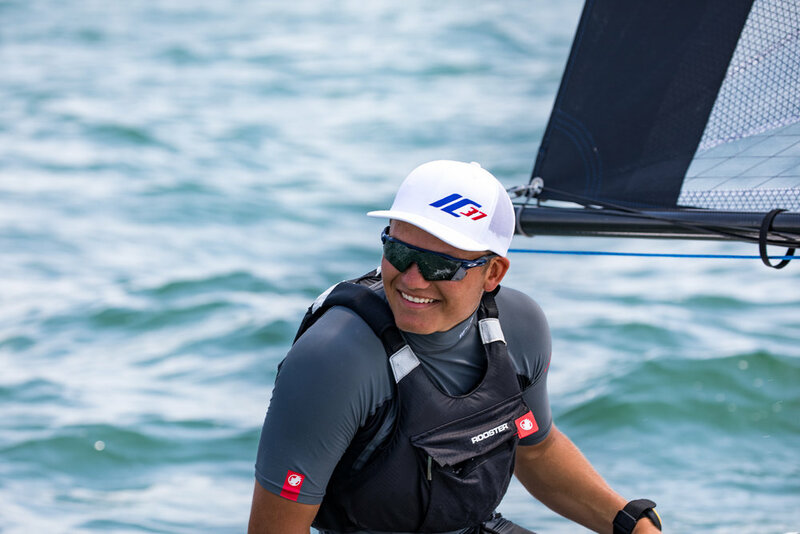 Chapman Petersen used superior downwind boat speed and finished the day in second with a 5,1 followed by Harry Melges III in third with a 3,4. 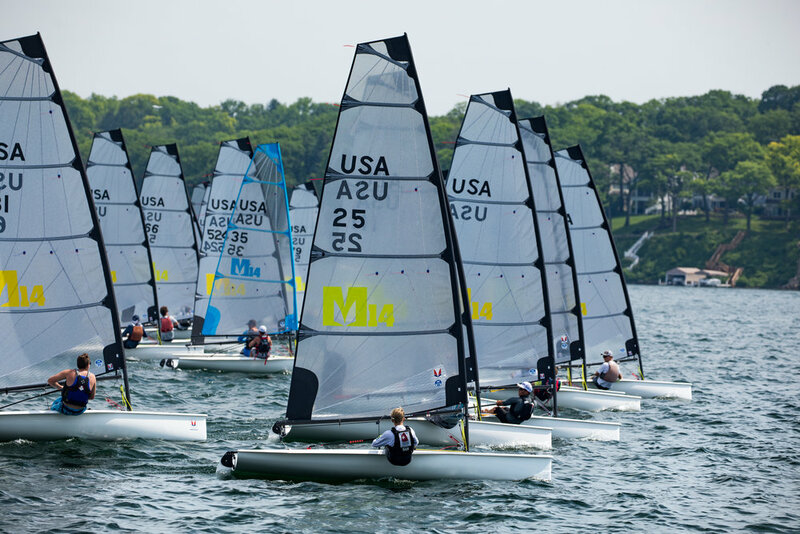 On Saturday morning sailors were greeted with a light 5-8 kt breeze for the first two races. Race Three saw Eddie Cox jump out to an early lead. Race Four was dominated again by Chapman Petersen. The early evening saw a strong 8-13 knot easterly fill across Lake Geneva for the next two races of the day. Race Five saw Harry Melges IV jump out to an early lead taking advantage of his excellent boatspeed in the moderate air. The start of Race Six pushed Michael Gillian into the leading position followed by Peyton Ankers and the always fast Clifford Porter; crowded mark roundings and big difference in pressure from left to right saw Harry Melges IV move up through the fleet and take the race. 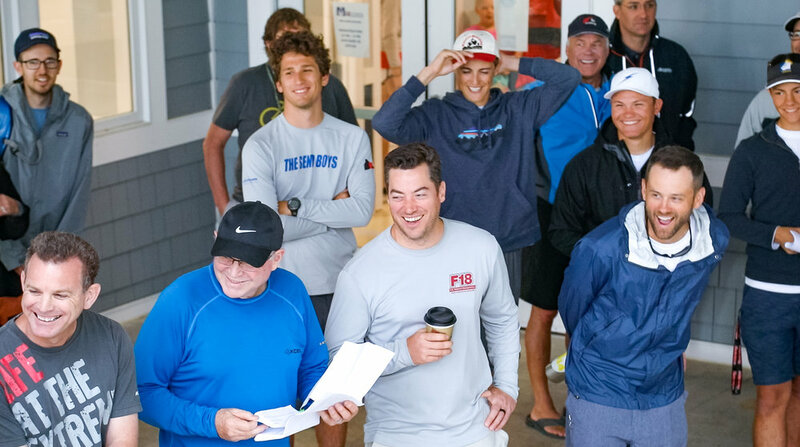 The real draw for these Melges 14 events is the class camaraderie. 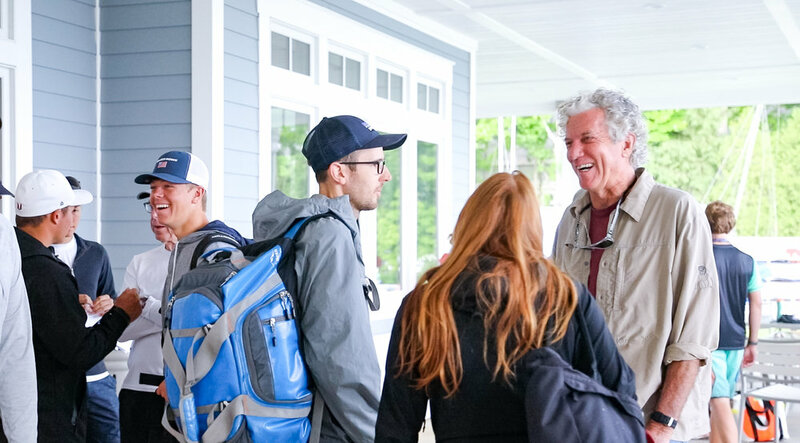 After a full day on the water, everyone enjoyed being a part of a fun family all together on land, swapping stories from racing and sharing laughs. 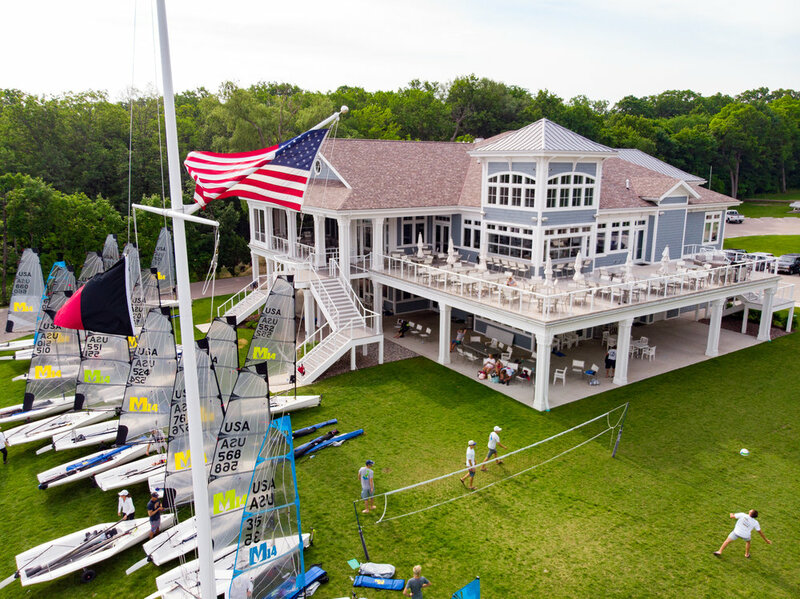 Saturday night brought sailors back to the Lake Geneva Yacht Club for the a steak dinner before a night out on the town. “Not often do you get a regatta dinner like this,” said David Oliver. After Saturday night's festivities, the sailors were greeted by a fresh and shifty 7-14 knot southwesterly. 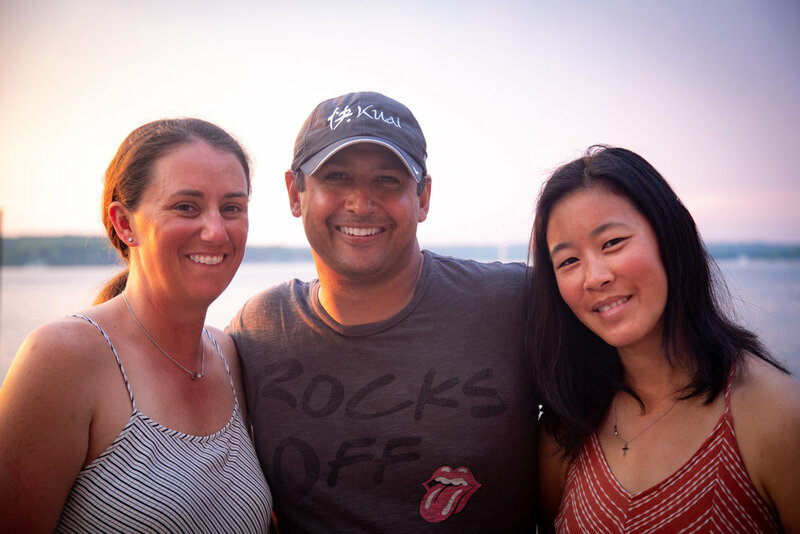 Three sailors entered the day with a chance to win the event. Chapman Petersen with 15 points, Harry Melges IV with 22 points and Eddie Cox with 23 points. Triangle course Race Seven saw Eddie Cox, Harry Melges IV and Jim Campbell out front early on. Cox led around the first weather mark only to be reeled in on the second reach leg. Petersen sailed through several boats and moved into third position around the leeward mark. The second beat saw Cox and Melges swap the lead several times only to round the final weather mark bow even. The last run saw more extremely close racing with Petersen gaining throughout the entire run making it a three boat race. At the finish it was Melges, Cox then Petersen. Race Eight saw Harry Melges IV launched early. Olympian Marek Valasek rounded in second followed closely by Cox. Petersen found himself deep in the fleet with plenty of time for a comeback. 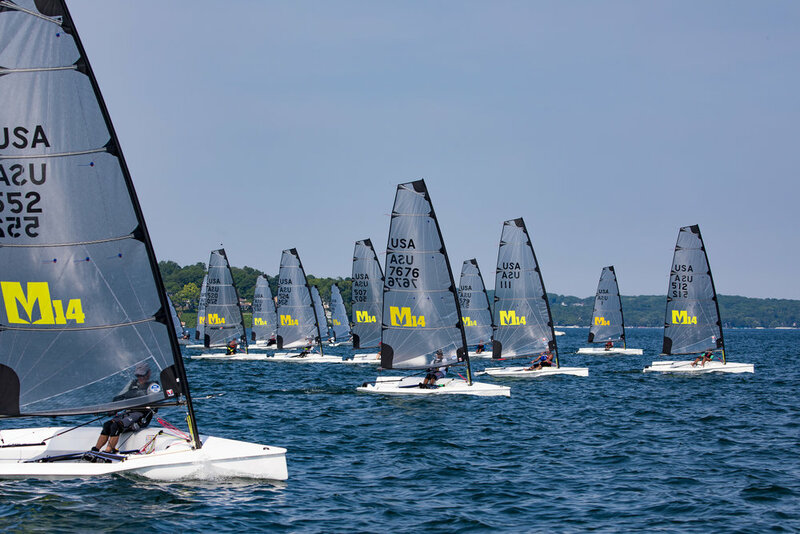 At the first leeward mark, Melges had maintained his lead while the race order remained mostly unchanged. The second beat saw Melges and Valasek sail towards the left with Cox splitting and heading right. A large right handed shift moved Cox into second and reduced Melges’s lead to 10 boat lengths at the top pin. 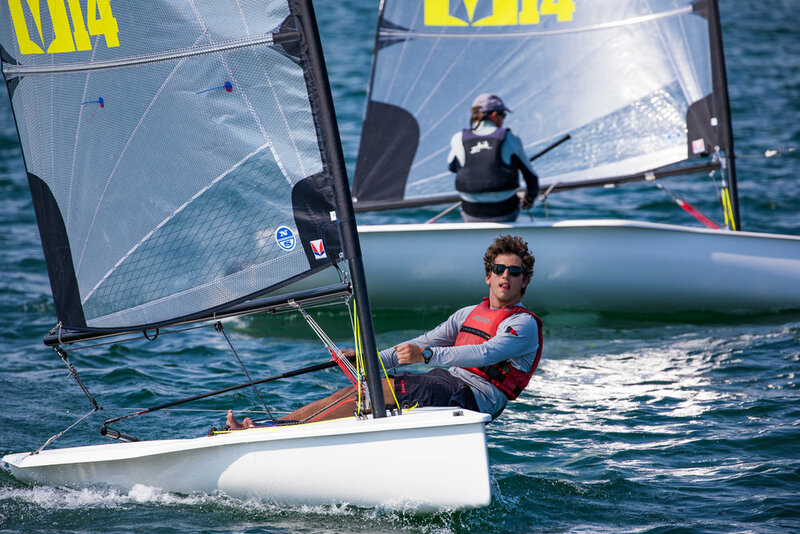 Melges maintained his lead until the last quarter of the final run when Cox jibed to port and sailed into an overlap with Melges. With less than 50 yards to go, Cox jibed back to starboard forcing Melges to jibe; Cox edged ahead just in time to take the gun. Petersen finished in eighth place, his worst of the series. The title would be decided on the last race. One point separated each of the top three: Melges with 22, Cox with 23 and Petersen with 24. A pin favored start saw Clifford Porter, Jack Schweda, Richard Chapman and Cox tack to port at go and cross the fleet. Melges and Petersen were forced to sail a brief starboard to find a clear lane. A large left handed shift pushed Cox, Porter and Chapman out front. Melges’s early decision to leverage into the left paid off as he was able to recover from a poor start and move into third place around the top pin. Cox led at the first leeward mark followed closely by Melges and Richard Chapman. An early tack to the left by Melges and Chapman saw Cox’s lead evaporate, closely crossing both Melges and Chapman. 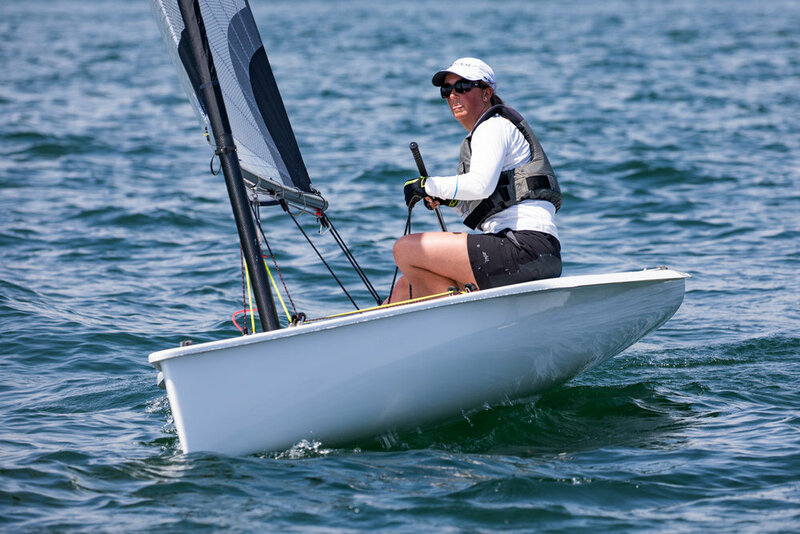 Melges tacked to split with Cox, found fresher breeze on the left side of the course, and snatched the lead away from Cox at the final weather mark. Cox rounded second followed by Chapman, Porter and Petersen. 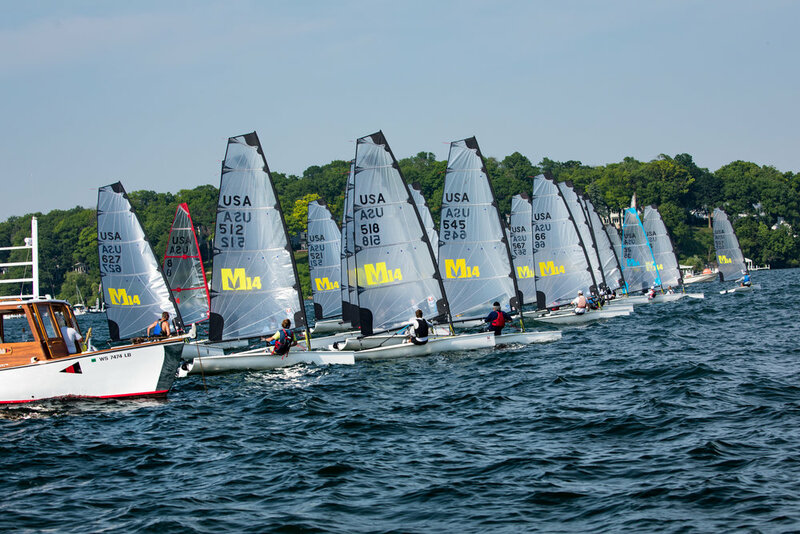 Melges finished with smoke, the sound of the LGYC gun, and the first ever Melges 14 U.S. National Champion title. Cox finished in second, quickly sailing over to Melges to give him a congratulatory dunk. Results are available at the event website. 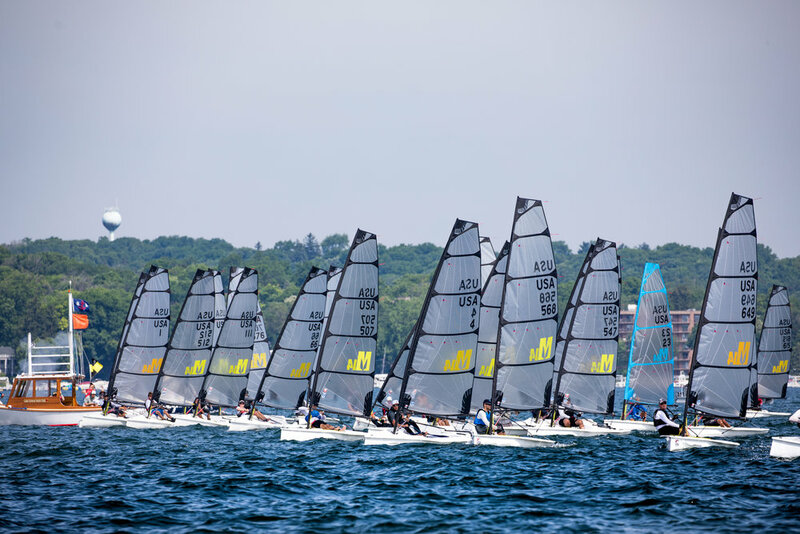 The next championship on the Melges 14 circuit is the Melges 14 Summer Championship in New York. 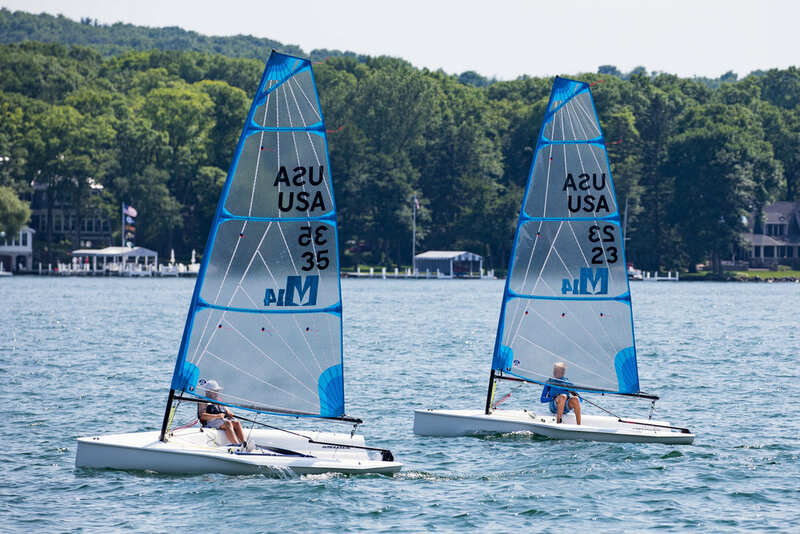 Contact the Melges Team to learn about local dealers, new boats, test sails and regatta charters. Top Ten – Top row L to R: Eddie Cox, Jack Schweda, Jim Campbell, Richard Chapman, Marek Valasek. Bottom row L to R: Harry Melges IV, Kyle Navin, Chapman Petersen, Josh Landers. Not pictured: Dave Powlison.